Jacqie McWilliams, Commissioner of the Central Intercollegiate Athletic Association (CIAA), visits the 1.Question Podcast. 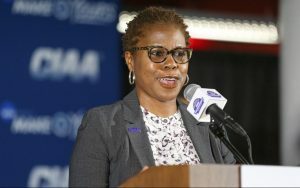 McWilliams, in her fifth year leading the CIAA, discusses the intricacies of hosting the conference’s basketball tournament in a city (Charlotte) which boasts a significant number other sports attractions. She also touches on how her background directing NCAA Basketball tournaments helped prepare her for such an undertaking.